Fancy a quick makeover of your bathroom? Here are some ideas that can be done in a weekend to give a real lift and freshen it up without having to completely remodeling. First place to start if you are looking to jazz up the look of your bathroom and better still, a clear out won’t cost you anything but you will notice a great improvement instantly. Start by clearing everything that you possibly can out of the bathroom by removing all the items from your cupboards and vanity unit so that you end up with as much empty space as possible, just as though you were moving in rather than clearing up. Try to be ruthless when you start putting items back by getting rid of what you don’t really need or use anymore and sort out the medicine cabinet into organized sections. Even if you end up putting a fair amount of your stuff back, at least you will have freshened it all up and created a neater and tidier look than before you started. Try to clear as much clutter from the floor in order to create a greater feeling of space. Ideas that will help you to achieve this include adding some extra towel bars, putting up some more hanging hooks and maybe adding a small bathroom unit, which will take up some of that space of course, but it will make everything look neat and tidy in the process. If you are adding some more towel bars, why not consider adding one for each member of the family so that they are encouraged to use their own towel and will be discouraged from just leaving them on the floor, hopefully! It sometimes takes a little bit of creative thinking to make the most out of the space available in the bathroom. 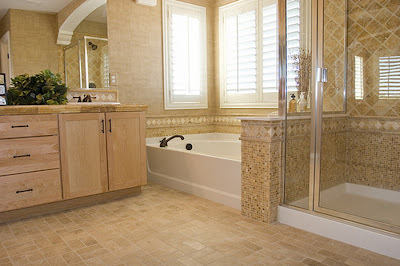 It is very easy to take a conventional view of organizing a bathroom and miss potential storage areas. A good example of this is to consider making use of the wall space above the door to put a small shelf up for storing some spare towels or other items. It is not an obvious area that you eye is drawn to so it will not spoil the look of the bathroom but especially if the room is quite small, it will boost the floor space and keep the main area looking less cluttered. Keeping everything out of sight but within easy reach is the best way of creating a workable but neat and tidy bathroom. If you have some shelves already up with all the bathroom accessories on show, try buying some suitable boxes that can go on the shelf to hold all those items within reach but out of sight. Once you have tidied up as much as possible and sorted out your storage solutions, it is time for a few extra touches to freshen up the room and complete your quick weekend makeover. Try adding a new touch of color maybe by getting a new rug for the floor or maybe repaint the mirror frame or cabinets in a vibrant new shade so that you can really notice the difference without spending a fortune. Jamie Parham enjoys DIY projects around the home. His articles mainly appear on homeowner blogs where he passes on his insights. Get some mosaictiles cheap ideas, visit the link.